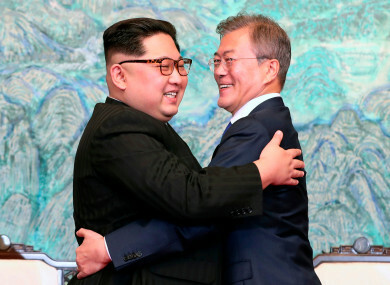 North Korean leader Kim Jong Un, left, and South Korean President Moon Jae-in embrace each other after signing on a joint statement at the border village of Panmunjom in the Demilitarized Zone. NORTH KOREA HAS promised to close its atomic test site next month and invite US weapons experts to the country. The reported pledge from the North’s leader Kim Jong Un follows weeks of whirlwind diplomacy that saw Kim and South Korean President Moon Jae-in agree to pursue the complete denuclearisation of the peninsula during a historic summit on Friday. “Kim said, during the summit with President Moon, that he would carry out the closing of the nuclear test site in May,” Seoul’s presidential spokesman Yoon Young-chan said. Kim said he “would soon invite experts of South Korea and the US as well as journalists to disclose the process to the international community with transparency”, Yoon added. Tension has been high on the flashpoint peninsula since last year when the North carried its sixth — and most powerful — atomic test and test-fired missiles capable of reaching the US mainland. “Kim said ‘the US feels repelled by us, but once we talk, they will realise that I am not a person who will fire a nuclear weapon to the South or the US or target the US,” according to Yoon. Kim also slammed speculation during his meeting with Moon that the Punggye-ri test site was already unusable after an underground tunnel there reportedly collapsed. “As they will see once they visit, there are two more tunnels (in the test site) that are even bigger… and they are in good condition,” he was quoted as saying. The remarks are likely to be seen as a sweetener ahead of Trump’s own planned summit with Kim, which the US president said would take place “in the next three or four weeks”. Trump touted his ability to achieve a nuclear deal with the regime at a campaign-style rally in Michigan to cheers and chants of “Nobel! Nobel!”. The US leader has been eager to play up his role in achieving a breakthrough with Pyongyang through his “maximum pressure” campaign involving tough rhetoric, strengthened global sanctions and diplomatic efforts to further isolate the regime. “Months ago, do you remember what they were saying? ‘He’s going to get us into nuclear war, they said,’” Trump told supporters in Washington Township, north of Detroit. “No, strength is going to keep us out of nuclear war, not going to get us in!” he added. But Trump also sounded a note of caution, saying he was prepared to walk away if US demands for North Korea to relinquish its atomic arsenal in a complete, verifiable and irreversible way were not met. His remarks came as his new Secretary of State Mike Pompeo told ABC News he had a “good conversation” with Kim during his secret visit to Pyongyang over Easter weekend, adding that Kim was “prepared to… lay out a map that would help us achieve” denuclearisation. Trump held phone calls yesterday with both Moon and Japan’s Prime Minister Shinzo Abe, declaring “things are going very well”, as CBS News reported that Mongolia and Singapore are the final two locations under consideration for his meeting with Kim. The North once invited foreign observers and journalists to its main Yongbyon atomic complex in 2008 when it destroyed an aged cooling tower — with the dramatic explosion televised globally within hours. That event did not slow the North’s nuclear drive, but the situation looks more upbeat this time, Hong Min, analyst at the Korea Institute for National Unification, told AFP. “There’s a vast difference between blowing up a cooling tower and dismantling your only and, if what Kim said was right, functioning nuclear test site,” he said, adding Kim was “giving away in advance one of the major chips he could have saved for the actual meeting with Trump”. “Given this is only a conciliatory move in the build-up to the summit, I think the meeting is likely to produce something more concrete,” he said. Pyongyang has demanded as-yet-unspecified security guarantees to discuss its arsenal, but Kim could use the meeting to agree on “the range of nuclear weapons and facilities to be dismantled and specific time frame to do so”, said Hong. In a joint statement, the two Korean leaders also pledged to seek a peace treaty this year to formally declare the Korean War over. Email “North Korea promises to shut nuclear test site next month”. Feedback on “North Korea promises to shut nuclear test site next month”.